For more than 20 years, Diesel has been a part of youth culture worldwide by creating quality clothing and accessories that defy mainstream styles. This year, teaming up with Foscarini, Diesel was inspired by everything from underground miner to pop art to deliver Diesel with Foscarini lighting products with the same bold unpredictability. Retaining the superb, contemporary design of Foscarini, the Diesel collection presents a truly unique feel for those with industrial chic taste. This collection showcases artisan craftsmanship with its irregular structure. 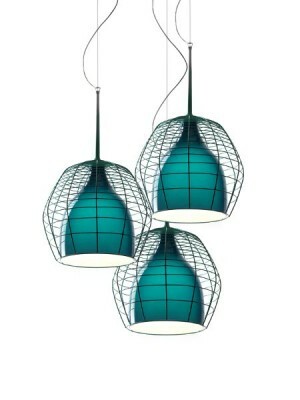 On its own, the lacquered metal cage is a stand-out design element, and the vibrant light gleams through a black, white of green blown glass shade underneath. A contemporary take on industrial lighting, the Glas collection leads a double life: quietly reflecting its environment on the chrome metal finish by day, and emitting a steady, warm beam through the blown glass diffuser by night. Informal and playful, the Fork is ideal for creating a relaxed atmosphere. The fabric shade rotates 360 degrees and was stitched to be similar to jeans. Flexible joints on the metal stand make it versatile enough for any space. The Graf collection is all about the shade: Glossy fabric dressed up with highly stylized images (up-close shots of nature or a DJ’s console) that give it a pop-art feel to inject personality into any space. The glossy finish of the shade gives it a wet-paint look. Plus, a fun little lightning bolt hangs from under the funky shade. 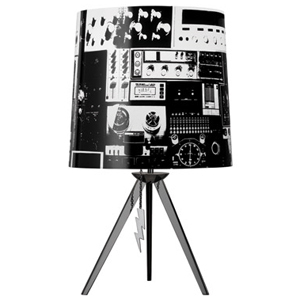 Click here to shop the Diesel with Foscarini collection now.